Korea's provinces describes the historical evolution of provinces in Korea (Do ; Hangul: 도; Hanja: 道). For current administrative divisions, see Administrative divisions of North Korea and Administrative divisions of South Korea. Provinces (Do) have been the primary administrative division of Korea since the mid Goryeo dynasty in the early eleventh century, preceded by provincial-level divisions (Ju and Mok) dating back to Unified Silla in the late seventh century. Koreans represent one of the most, if not the most, homogeneous peoples in the world. Although that is true, Korea's still exhibit striking regional characteristics that all Koreans recognize. The Joseon dynasty government acknowledged those unique characteristics, redrawing provincial lines into eight provinces that have stayed firm to the present day. With the division of Korea, five new provinces have been created several to accommodate the division along the 38th parallel. Whether Korea maintains those new provinces after the reunification remains an open question. During the Unified Silla Period (AD 668-935), Korea divided into nine Ju (주; 州), an old word for "province" used to name both the kingdom's provinces and its provincial capitals. After Goryeo defeated Silla and Later Baekje in 935 C.E. and 936 C.E. respectively, the new kingdom "was divided into one royal district (Ginae; 기내; 畿內) and twelve administrative districts (Mok; 목; 牧)" (Nahm 1988), then redivided into ten provinces (Do). In 1009 the Goryeo dynasty redivided the country into one royal district, five provinces (Do) and two frontier districts (Gye; 계; 界?). The name and concept of Do originated from the Chinese Dao. After the Joseon Dynasty's established in 1392 C.E., the royal court redivided Korea into eight new provinces (Do) in 1413. The provincial boundaries closely reflected major regional and dialect boundaries, still often referred as the Eight Provinces (Paldo). In 1895, as part of the Gabo Reform, [[Emperor Gojong of Korea|King Gojong) redivided the country into twenty three districts (Bu; 부; 府), replaced a year later by 13 new provinces. The 13 provinces of 1896 included three of the original eight provinces, with the five remaining original provinces divided into north and south halves (Bukdo (북도; 北道) and Namdo (남도; 南道) respectively). The thirteen provinces remained unchanged throughout the Japanese Colonial Period. With the surrender of Japan in 1945, the Korean peninsula divided into Soviet (northern) and American (southern) zones of occupation, with the dividing line established along the 38th parallel. (See Division of Korea for more details.) As a result, three provinces of Hwanghae, Gyeonggi, and Gangwon (Kangwŏn) divided into Soviet and American occupied sections. Seoul and P'yŏngyang received the special cities in 1946. Between 1946 and 1954, South and North Korea created five new provinces: Jeju in South Korea, and North and South Hwanghae, Chagang, and Ryanggang in North Korea. Since 1954, provincial boundaries in both the North and South have remained unchanged. New cities and special administrative regions have been created, however: see Special cities of Korea for their history. For a comprehensive description of Korea's provinces and special cities today, please see Administrative divisions of North Korea and Administrative divisions of South Korea. In 660 C.E., the southeastern kingdom of Silla conquered Baekje in the Southwest, and in 668, Silla conquered Goguryeo in the north with the help of China's Tang Dynasty (see also Three Kingdoms of Korea). For the first time, a single power ruled most of the Korean peninsula. 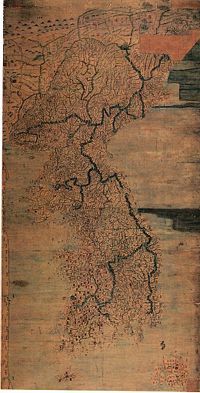 Silla's northern boundary ran through the middle of southern Goguryeo, from the Taedong River (which flows through P'yŏngyang) in the west to Wŏnsan in modern-day Gangwon Province in the east. In 721 C.E., Silla solidified its northern boundary with Balhae (which replaced Goguryeo in the north) by building a wall between P'yŏngyang and Wŏnsan. Silla located its capital, Geumseong (modern-day Gyeongju), and sub-capitals at Geumgwan-gyeong (Gimhae), Namwon-gyeong, Seowon-gyeong (Cheongju), Jungwon-gyeong (Chungju), and Bugwon-gyeong (Wonju). Silla divided into nine provinces (Ju): three in the pre-660 territory of Silla, and three each in the former kingdoms of Baekje and Goguryeo. The table below lists the three preceding kingdoms, each province's name in the Roman alphabet, Hangul, and Hanja, as well as the provincial capital, and the equivalent modern-day province. In 892 C.E., Gyeon Hwon founded the kingdom of Later Baekje in southwestern Silla, and in 918, Wanggeon (King Taejo) established the kingdom of Goryeo in the northwest, with its capital at Songak (modern-day Kaesŏng). In 935, Goryeo conquered the remnants of Silla, and in 936 conquered Later Baekje. Goryeo greatly expanded Songak greatly expanded with the new name Gaegyeong. Taejo expanded the country's territory by conquering part of the land formerly belonging to Goguryeo, in the northwest of the Korean peninsula, as far north as the Yalu River. Goryeo constructed a wall from the Yalu River in the northwest to the Sea of Japan (East Sea) in the southeast, on the boundary between Goryeo and the northeastern Jurchen territory. The Goryeo court soon redivided the twelve districts into ten provinces (Do; 도; 道). Gwannae-do included the administrative districts of Yangju, Hwangju, Gwangju, and Haeju; Jungwon-do included Chungju and Cheongju; Hanam-do replaced Gongju; Gangnam-do replaced Jeonju; Yeongnam-do replaced Sangju; Sannam-do replaced Jinju; and Haeyang-do replaced Naju and Seungju; the three other new provinces were Yeongdong-do, Panbang-do, and Paeseo-do. Finally, in 1009, the Goryeo royal court again redivided ten provinces, this time into five provinces (Do) and two frontier districts (Gye; 계; 界?). 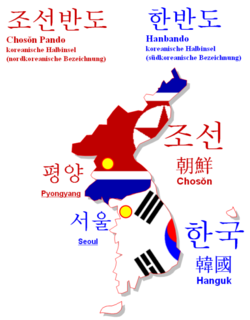 During most of the Joseon Dynasty, Korea divided into eight provinces (do; 도; 道). The eight provinces' boundaries remained unchanged for almost five centuries from 1413 C.E. to 1895 C.E., forming a geographic paradigm reflected in the Korean Peninsula's administrative divisions, dialects, and regional distinctions today. The names of the eight provinces today, in the same or similar form. In 1413 C.E. (the thirteenth year of the reign of King Taejong), the northeastern boundary of Korea extended to the Tumen River. The throne reorganized the country into eight provinces: Chungcheong, Gangwon, Gyeonggi, Gyeongsang, Jeolla, P'unghae (renamed Hwanghae in 1417), P'yŏngan, and Yŏnggil (eventually renamed Hamgyŏng in 1509). The new system of districts lasted only one year, until August 4, 1896 (the 33rd year of King Gojong), when Gojong restored the former eight provinces, five of them (Chungcheong, Gyeongsang, Jeolla, Hamgyŏng, and P'yŏngan) divided into north and south halves to form a total of thirteen provinces. The resulting thirteen provinces—the eight traditional provinces, with five simply divided in half—remained unchanged through the eras of the Korean Empire (1897–1910) and the Japanese Colonial Period (1910–1945). 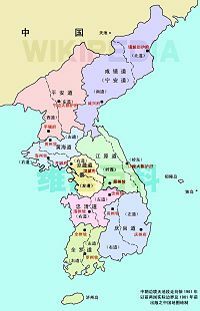 Since the end of World War II and the division of Korea in 1945, special cities and administrative regions, along with a handful of new provinces, have been added in both the South and North. The boundaries between the eight provinces followed, for the most part, rivers, mountain chains, and other natural boundaries, and consequently corresponded closely to dialect and cultural divisions. Because of that natural fit between the provincial boundaries and the real divisions in Korea, most of the provincial boundaries and names have survived in one form or another to today, and most Koreans maintain a keen awareness of the regional and dialect distinctions that still exist. For example, a famous regional rivalry exists between Gyeongsang and Jeolla residents, due to historic social, economic, and political differences. Most of the traditional provinces also had alternative regional names still used today (especially Honam, Yeongdong, and Yeongnam). Paldo sori to broadly refer to the diversity of folk music (sori; "sounds") across Korea. Cf. The four Provinces of Ireland—where reference to the ancient provinces refer to the entire Irish island. With the exception of Gyeonggi (see note 2 below), each province took its name from the initial Hanja (Sino-Korean characters) of two of its principal cities, as shown in the following table. 1. Pronounced "Ho-suh," not "Ho-zay-oh," as the spelling might suggest. 2. "Gwandong" is the name for the region as a whole, with "Yeongseo" denoting the western half of the province and "Yeongdong" the eastern half. "Yeongdong" is used more often than either of the other two terms, however, especially in reference to railway and road arteries that cross through Gangwon, connecting the Seoul and Yeongdong regions. 3. The province's name literally means "area within a 500-li (200-km) radius" (gi; 畿) of the "capital" (Gyeong; 京), referring to the royal capital Hanseong (modern-day Seoul). The regional name "Gijeon" is obsolete. The twentieth-century term "Sudogwon" ("Capital Region") is used today to denote the Seoul-Incheon conurbation and that part of Gyeonggi Province that forms part of the same built-up, urban area. 4. "Kwanbuk" was used to designate either the province as whole, or only the northern part thereof. In the latter case, "Kwannam" was then used to denote the southern part of the province. 5. The modern-day division of the province into North and South did not occur until 1954. 6. The initial "n" in "Naju" is pronounced as "l" (lower-case "L") when it comes after another consonant; the final "n" in the "Jeon" of "Jeonju" is then assimilated to an "l" sound. 7. The distinctive Jeju Dialect is used on Jeju Island, which became a separate province in 1946. At the end of World War II in 1945, Korea divided into American and Soviet zones of occupation. (See Division of Korea for more information.) The peninsula divided at the 38th parallel, with the Americans controlling the south half of the peninsula and the Soviets controlling the north half. In 1948, the two zones became the independent countries of North and South Korea. The three provinces of Hwanghae, Gyeonggi, and Gangwon divided at the 38th parallel. Most of Hwanghae Province belonged to the Soviet (northern) zone. The southern portion became part of Gyeonggi Province in the south. Most of Gyeonggi Province belonged to the American (southern) zone. In 1946, the northern portion became part of Kangŏn Province in the north (see next item). Gangwon Province was divided roughly in half, to form modern-day Gangwon Province in South Korea and Kangwŏn Province in North Korea. The northern province expanded in 1946 to include the northern portion of Gyeonggi Province and the southern portion of South Hamgyong Province (around the city of Wŏnsan). Also in 1946, the cities of Seoul in the south and P'yŏngyang in the north separated from Gyeonggi and South P'yŏngan Provinces respectively to become Special Cities. Finally, the North and South Korea governments formed the new provinces of Jeju (in the south, in 1946) and Chagang (in the north, 1949) from parts of South Jeolla and North P'yŏngan respectively. In 1954, Ryanggang Province split from South Hamgyong. ↑ The Cantonese-English dictionary translates 州 variously as "prefecture" or "department." Nahm, Andrew C. 1988. Korea: Tradition and Transformation; A History of the Korean People. Elizabeth, NJ: Hollym International. History of "Provinces of Korea"
This page was last modified on 11 June 2015, at 18:58.